Inder Loves Folk Art: Milestones: Helen's Second Birthday and Joe's First Trip to the ER. Milestones: Helen's Second Birthday and Joe's First Trip to the ER. This post was supposed to be about only one major milestone. My niece, Helen, turned two this past weekend. Unfortunately, just a week before that, she was running around her at-home daycare, got her foot caught on an infant bouncy seat, and broke her little shin bone (tibia). Ouch! So the poor little mouse is currently sporting a cast that goes from her toes to her mid-thigh. It doesn't seem to be bothering her too much now, but you can tell she is sad to see her little friends running and cavorting around while she is limited to sitting and watching. Luckily, we grown-ups know well what is probably a bit abstract to Helen - that the next four to six weeks are going to pass in a flash, and she'll be running with her friends again in no time! So for her birthday, I wanted to make (1) something she could comfortably wear over her big cast; and (2) something she could play with quietly without having to move too much. Helen loves her baby doll, so I decided to make matching outfits for Helen and Helen's doll (a soft, plush, almost newborn-sized doll). For Helen, I made a pair of Oliver + s Nature Walk Pants, which I think will be plenty wide-legged enough to comfortably fit over her cast, and an a-line sleeveless tunic/dress using Made by Rae's Flashback Skinny Tee pattern. I made the same modifications to the top that I did for Joe's tank top (it's hard to see in the photo above, but I used cream ribbing around the neck and armholes here, which will hopefully photograph better on Helen), and lengthened and flared the sides into a dress. And of course, I added a tiny stripey pocket, to match the pants. For Helen's baby, I made matching pants and an a-line apron top with a little Velcro in the back for ease of dressing up. I basically winged these items based on measurements provided to me by my sister (for the pants, I modified the Newborn Knit Pants pattern), so I have my fingers crossed that they will work on Helen's doll. 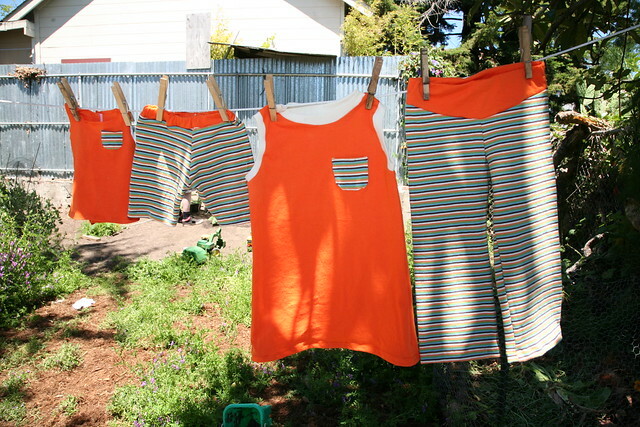 With this project, I finally used up most of this day-glo orange and stripey orange knit, leaving only scraps. Incidentally, if you're wondering how many items of children's clothing you can make with two yards of 60" wide knit, the answer can more or less be seen here, here, here, and here. It's been a great run, and I really love these fabrics, but I can't say I'm entirely sorry to see the last of this stuff! I have many other knits clamoring for my attention (although none quite so loud as these at the moment). I hope little Helen likes her birthday present! But then there was a second milestone: Break out the baby book! Joe's first trip to the emergency room! Not long after I finished and photographed this little project yesterday, Joe cut himself pretty deeply on an exposed nail while running and playing. He didn't cry very much, so when he presented me with his "ouchy" and I saw a small but really deep and ugly cut, I was a little surprised! As anyone who knows Joe in person knows, he has an unusually high threshold for pain for a three year old, but this seemed a bit extreme even for him. Both Steve and I took one look at it and said, "Ugh. He needs stitches." So we packed him up and headed over to the ER, where the triage nurse took one look at the cut and seemed to agree with us. And then they made us wait for five hours before actually stitching him up. As I'm sure many of you know, this is what happens when you bring a child with a non-life-threatening injury to the ER on a Sunday night. Joe hated the ER and was miserable. Actually, with nothing more than a piece of gauze covering the nasty gash on his arm, he was pretty much his usual self, running around, getting into mischief with medical equipment, smiling, and generally having a blast. Steve and I, on the other hand, were bored out of our minds. And I was really hungry (we missed dinner) and trying not to add "pregnant woman fainted from hunger" to the hospital's caseload that night. So while Joe ran around getting into trouble, we whiled by the hours playing with our phones and joking that maybe if Joe seemed a little less cheerful and less totally thrilled out of his mind to be up hours past his bedtime, we would get faster service? Towards the end of our stay, Joe started to tell us, "I want to go home." As an aside, you know you've got a kid with a speech delay when you hear your child say this at the ER, and your first thought is, "Wow, that was a perfect sentence! Go Joe!" So anyway, I kept telling him, "You have a big ouchy, and the doctor needs to fix it up. Then we'll go home." After a while, he responded, "No big ouchy. Teeny tiny ouchy! Go home! Tiny ouchy!" Oh, honey! My heart broke a little for my brave boy there. "No, honey, I wish it was a tiny ouchy, but it's a big ouchy. It needs a doctor to fix it up." When the time finally came to stitch Joe up, he was basically a superstar. He let the nurses strap him into a "papoose" without much complaint. While the doctor was injecting the lidocaine, it obviously hurt (we all know that's the worst part, right? ), but Joe didn't cry. He just wimpered, "doctor fix up ouchy!" Later, while the doctor was stitching him up, she told him he was being really good, and Joe looked sad, but just repeated determinedly, like a little toddler mantra, "really good! really good!" My brave, stoic, seriously good little boy. At that moment, I was so pained that he had to go through this, but also so, so crazily proud of him. I wanted to tell him he didn't need to be so brave, that it was okay to cry, but I was trying too hard to be brave and not to cry myself. I was also trying not to watch what the doctor was doing, because, yeeesh. You can be sure Joe didn't get his toughness from his mother. I'm 100% positive I would have complained more if this happened to me as an adult, forget at Joe's age. Result? Two little stitches in my baby's chubby, cute little forearm. No big deal in this wonderful world of modern medicine. Definitely a "tiny ouchy" compared to Helen's broken leg, which is also, in the scheme of things, not too big a deal. Once the sutures were in, Joe was back to his normal self, and, like the sensible child that he is, decided he was outta there. We couldn't agree more! Seriously, we left that place so fast, the nurses almost had to run after us with our discharge forms. So that's that. In seven to ten days, Joe will get his stitches out and in the meantime, the big challenge will be keeping them clean, given that most of Joe's favorite activities involve dirt. This morning, I asked Joe if his arm hurt, and he just pointed to his sutures, grinned, and said "all fixed up! "And then he ran away to do Joe-like things. Probably involving dirt. And thank goodness for the tetanus vaccine! Oh wow! Joe is amazing! I'm glad he's none the worse for wear. I bet Helen is going to really enjoy her gift! May she be up and running again really soon! Yeah, he's pretty much over it now! I still have some recovery to do, though! Can't wait to give Helen her gift! That he is. That child has a stiff upper lip. He's always been like this! Five hours... big points to you and Steve for stoicism too. Love that photo of Joe enjoying the hospital! I was wondering how much further those knit fabrics would go when I saw them again, I think they're fabulous but I can relate to finally having used something all up :) Sweet idea about the matching girl/doll clothes. Well, there's nothing like five hours in a hospital waiting room seeing kids with much worse problems to put a couple stitches into perspective, so I suppose it was valuable in its way! Yeah, kind of glad to say goodbye to those two fabrics. I've made lots of cute things from them, but I am ready to move on! Ha ha, what a boy! 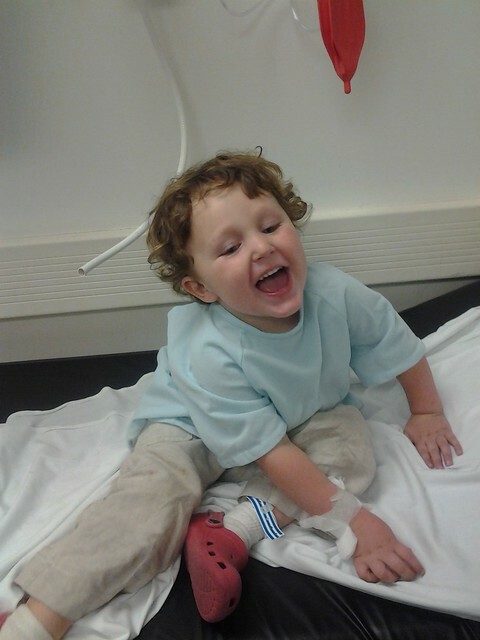 :) glad he's ok and just needed a few stitches. And I know what you mean about those wide knits, they go such along way. The matching outfits are really cute! Yep, he's a trooper. Thanks!! Oh, and I love the little matching outfit. Your niece is going to LOVE it! Here's to no more trips to the ER!!!! I think Joe actually had *fun* at the ER (besides the part where they actually had to work on him). Which is amazing. Especially considering he had a giant hole in his arm. Also, yes. Child, please don't do that to us again, at least for a little while, okay? 'Kay, thanks! So glad Joe is okay, and so brave! I love the matching outfits you made for your niece, here's hoping everyone is all healed up in no time! I'll drink (something non-alcoholic) to that. Oh, good boy. Love the picture. They do like the adventure of medical dramas, don't they? And the intense parental and professional focus? Last time we went through something like this, I was shocked by how untraumatized my son seemed by the experience, but months later he carefully pointed out to me that he liked going to the doctor with his daddy, but he DID NOT like it when he got hurt and all the blood on his hands. Sigh. I wish you were my neighbour instead of the crazy/frowny lady who lives next door to me with her incessant perennial gardening. Then I could look over my fence and see the awesomest pants in the world hanging on a clothes line and wave hello. Such a brave boy! I would have cried. I would have cried if it was me getting the stitches, and I got a little teary when it was Joe getting the stitches. Joe, on the other hand - not a big crier, apparently! We knew this about him, of course, but wow. It was kind of gross! My husband held Joe down so that the doctor could stitch him up, and wow, he has a stronger stomach than I do! Blech! Awww Joe!!! What a trooper. You too. Next time, when you offer to bring food, the answer will be YES. I mean, what were we thinking, turning you down? Oh no! Poor sweet bub (even though he seemed to take it awesome!). This reminded me of Mr. Pants sauntering around the ER and stirring up the other kids while covered in bee stings. Brandon complained for DAYS about the pain(he had a few stings too) and here was my little guy COVERED in 22 stings on his tiny 2 year old body and acting like it was no big thing lol Lil tough guys! I love the outfits you made for your neice and her doll! What a sweet idea!